Undoubtedly new CBD congee cafe Lawyers, Guns and Money has caused the biggest stir on the Asian breakfast front. Chef Victor Liong of Lee Ho Fook has both the skills to make broken rice porridge seem appealing (note: it's Lee Ho Fook sous Mike Li cooking it) and the attitude to get the cafe some attention. But it turns out, loose-lipped Liong's not the only one telling smashed avo to "f*** off." We've seen a massive upswing in joints set up for new-school Asian breakfasts; not just Asian-accented (here's looking at you, kimchi scramble). 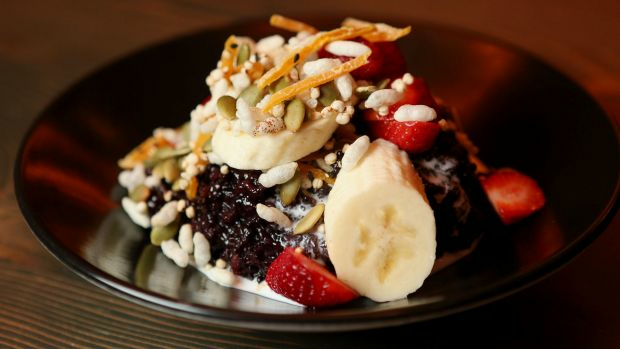 Entire menus dedicated to early-morning rice and noodles served up in Melbourne's signature industrial-cafe style. It also bears noting that the entire concept of brunch is pretty Western. Breakfast in a coffee shop in Japan is an unfussy affair: maybe a simple boiled egg with toast and a filter coffee. "It's not in our culture to spend money in the morning," Meg Tanaka, owner of Collingwood's Cibi cafe, says of brunch culture in Japan. "Most people eat breakfast at home." In south-east Asia the idea of "breakfast" becomes even more fluid. 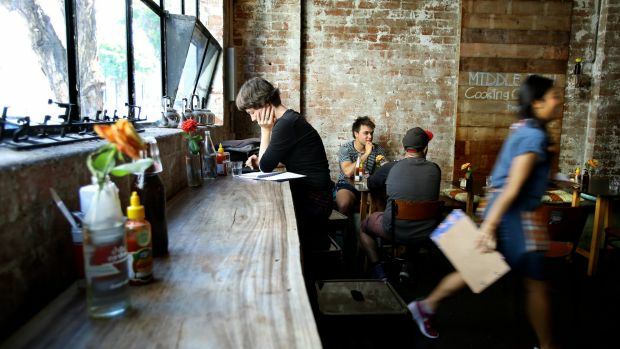 "In Thailand there's no such thing as breakfast food," says Pla Liamthong of Carlton cafe Middle Fish. "We just eat anything, any time." Liamthong says Thai people aren't looking for a big meal in the morning, so rice-based soups and crisp omelettes are popular dishes, although in the south of Thailand fried chicken is an acceptable breakfast food – clearly the rules are pretty lax. She says mornings are social time, with friends and family gathering in coffee shops to drink strong coffee, usually between 6am and 8am to beat the heat. 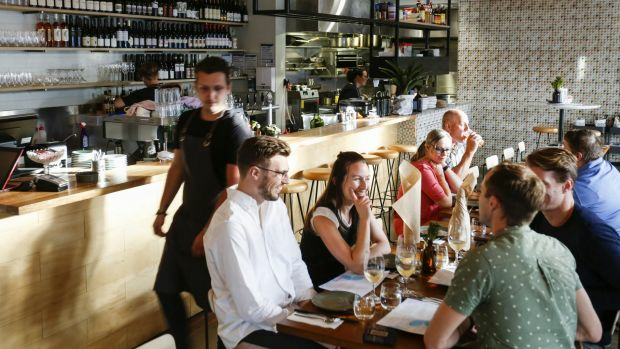 That's how it is at Middle Fish too, although it's more warehouse chic than a plastic stool on a sidewalk, and Liamthong opens her kitchen at the more Melbourne-friendly time of 10.30am. Best of both worlds, anyone? 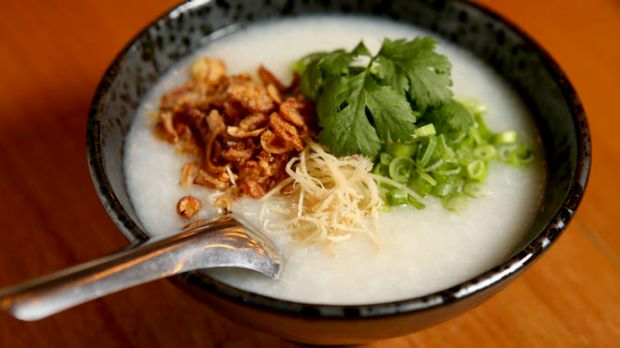 This broken rice porridge is China's answer to Jewish penicillin. Your base models are plain or fancy (flecked with poached chicken, shredded ginger and green onions); use this as a starting point to add sticks of Chinese doughnuts, salty master stock egg, tripe and pig's ears. Sprinkle fried shallots and white pepper at will. 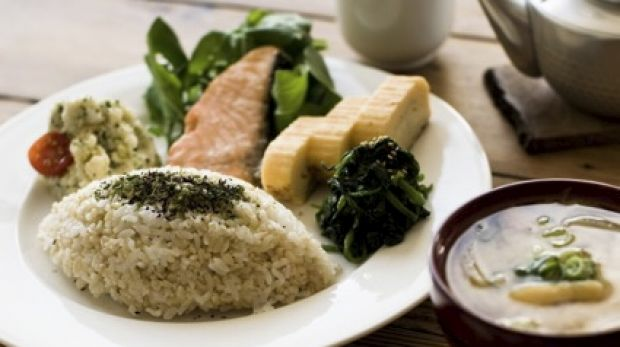 Longtime Japanese breakfast hero Meg Tanaka has been serving the breakfast her grandparents cooked for her as a child in Okayama for years in this homewares warehouse: grilled salmon, tamago (sweet omelette), miso soup and pickled vegies. The plates change weekly, but might involve pumpkin roasted in soy and mirin, salted grilled salmon, sour umeboshi plums and sticky natto – the fermented soy beans that pull apart like spider webs. It's all served with miso soup brimming with seasonal vegetables and wakame. 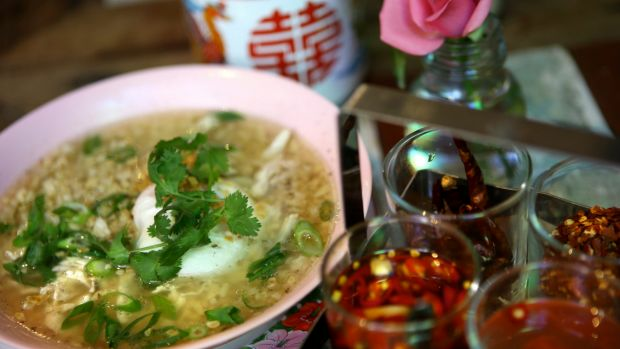 In Thailand this rice and vegetable soup is served with a raw egg cracked into the bowl right before serving; this Melbourne version sports an onsen-style egg along with a fragrant broth that gets a flavour hit from a paste of coriander root, fried garlic and Chinese celery. "It's simple, but not plain," says co-owner and self-taught chef Pla Liamthong, who uses brown rice to up the nutritional value, local barramundi and plenty of beanshoots, lime and crushed chillies, too. No one is doing Asian-inflected breakfast more thoroughly than Magic Mountain Saloon, the late-night and, it turns out, early-morning party bar helmed by Karen Batson (Cookie, Boney). Lacy thin omelettes envelop the fiery-funk of sardines, chilli and tomato, and there's a stack of noodle action, but you might want to back it up with something sweet – in particular, a griddled, folded roti bread filled with thinly sliced banana then doused in condensed milk, shaved coconut and almonds. 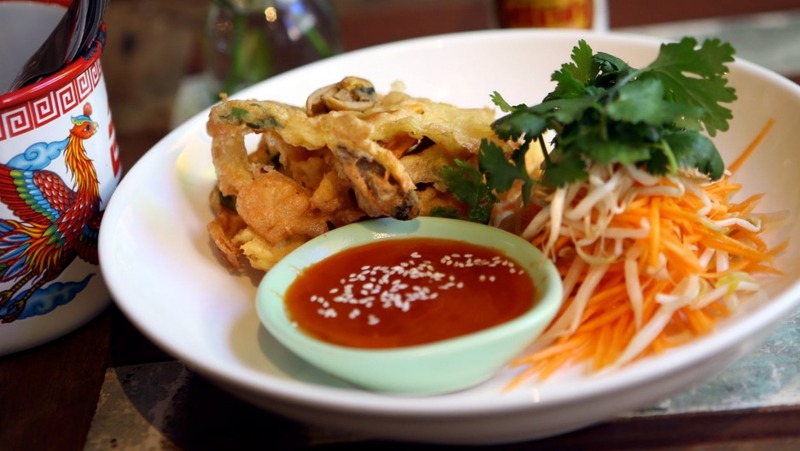 Thanks to a smart rebrand earlier this year it's out with suburban cafe (au revoir Le Chien) and in with this mod-Vietnamese diner slinging spicy, fragrant, share-friendly dishes that also make an appearance at brunch. Breakfast sides might be morning glory (water spinach) and your bacon and egg roll is branded a banh mi, stuffed with smoky bacon and eggs, pickled cucumber and carrot. You can go traditional with their congee, it's a supple version with chicken, and there's Thai noodles with calamari if you want to go full spice first thing. Jerry Mai kicked off a full Vietnamese breakfast menu of banh cuon (rice noodle rolls filled with minced pork and wood ear mushrooms) and sizzling beef platters in May. Then winter happened and no-one got up early. 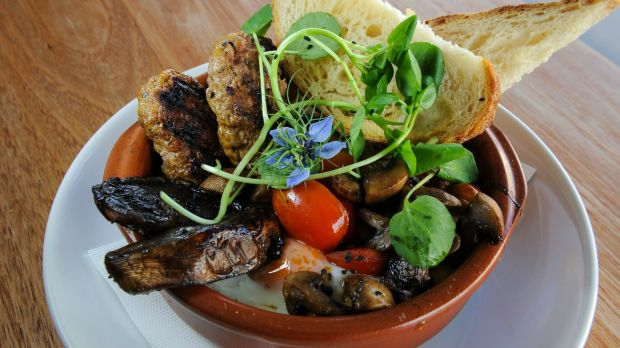 So, for the coming months they're sticking with 10am opening times and offering just the Saigon-style breakfast: essentially a fry up of minute steak and eggs on a sizzling platter with a baguette, pickles, pâté and egg butter. Full breakfast returns in summer. Peter Jo, aka Kimchi Pete, the young gun behind the Seoul of Sydney festival, reiterates that Korea doesn't tend to separate breakfast food. Soup and rice, however, is a thing. Closely aligned to ramen broths, soups are simmered for hours, eaten with rice – sometimes directly added in. Here on Lonsdale Street you can get dwaeji gukbab, the traditional soup made with pork trimmings and offal over rice, from 10.30am. They also do a version with black pudding and vegetables. It's the classic culture jamming mix here on Gertrude Street. Cumin in your hashbrown. Chilli in your eggs. They do a thick congee topped with a mess of crisped mushrooms and a poached egg, which is getting towards wet risotto for intensity. Special mention for the chicken pad kra paw too – stir-fried chicken fragrant with chilli, Thai basil and onions, chilli jam, laid out over rice with a lacy-edged egg. Get a fresh coconut. Live the dream. 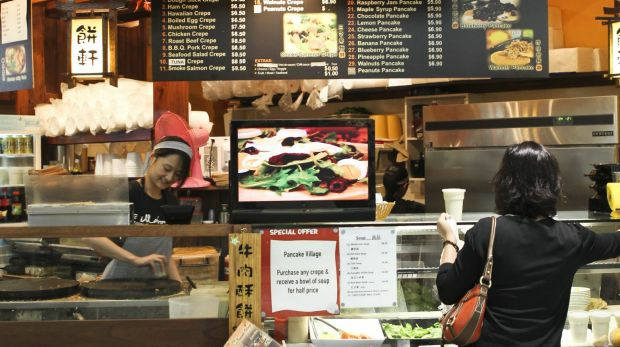 Finally, a word from our resident expert Tony Tan on breakfast in Box Hill: "One of the best things to do is to go on a brekkie crawl in Box Hill Central, where just about all things Asian are on offer. Begin at Pancake Village for jianbing, a delicious Beijing crepe traditionally filled with egg, hoisin sauce, spring onion and a savoury crunchy biscuit, though other options are available. Across the court you'll find Mr Kitchen, a stall featuring congee with pork and preserved egg or roast duck with ginger. Finish your crawl with warm Hong Kong style custard tarts at Grain Asia Dessert Bar."